Amazon India is revealing yet another toy from the upcoming Transformers: Bumblebee movie. 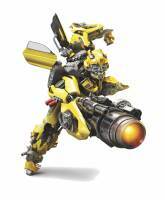 Formerly known as Role Play Item, the toy is revealed as Bumblebee Stinger Blaster. The item description also give away details of the Bee Vision Role Play Item, which we unraveled previously. Includes Transformers: Bumblebee — Bumblebee Stinger Blaster weapon, 5 discs, and instructions. Ages 5 and up. Join the buzz with the Transformers: Bumblebee — Bumblebee Stinger Blaster weapon inspired by the iconic Bumblebee blaster from the movie. Launch discs in blaster mode, then activate the pop-out conversion to continue the action in stinger mode. Weapon easily fits to wrist for action. Comes with a scannable code that unlocks a power up in the Bee Vision app (App play requires Bee Vision Bumblebee Augmented Reality Mask, sold separately. Subject to availability). Gear up and imagine unleashing the power within. 2017 Hasbro. All Rights Reserved. 2017 Paramount Pictures Corporation. All Rights Reserved. Transformers and all related characters are trademarks of Hasbro. Technical specifications can be found after the jump. Please tell me I can modify this to shoot one-step changer Stingers. So, is Bumblebee finally getting that stinger weapon that was dropped from the first movie? Seems like it. Or some kind of variation on it that's closer to the cyberverse one or Animated. Seems like it's suggested as some kind of non-lethal takedown tool or taser. Which makes sense why it wasn't used in the other movies. The decepticons they faced weren't really recon/info interrogation types or moments. Whereas this movie could potentially make use of it in many ways. 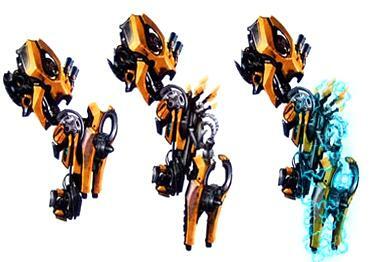 Going from the description at least with how the blaster form shoots disks but the stinger form doesn't. Suggests it's some form of close combat or other variation type tool. Though the bee vision app could also be why on that for AR reasons.